Hi, my name is Marne. 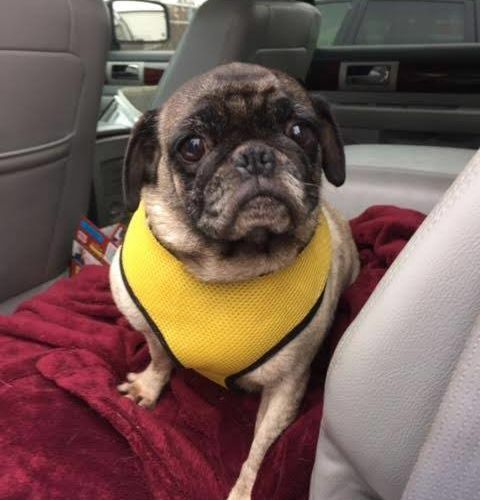 I was rescued by the beautiful people of Pug Partners of NE from an breeder. I was very lucky as my life could have turned out differently. It appears when I arrived in Nebraska the vet said it looked as if I had just given birth to a litter of pup’s a couple of weeks earlier. I apparently didn’t deliver all my puppies as I went into labor again and delivered another puppy a few days after being in my foster home. Sad to say, it didn’t make it and crossed the rainbow bridge. Since then I have been spayed and now ready to look for my forever home although my foster home is quite nice. I have a special attachment to my daddy. They say I am a Velcro dog. He was the one that picked me up and I spent the hour drive home with just him and I. So maybe that is why I am so close to him. I no longer sit at the door when he leaves for work, barking and howling. I have learned he comes back through the door a few naps later. Although I have been with my foster family for several weeks I am still skittish at sudden movements and loud noises. But once I am comfortable with you I expect a lot of love and attention. I am very friendly and like to be held and only jump into my daddy’s chair so far. I ask to be picked up when I want to be held by other‘s. My mom is home with me all day so I follow her around the house. She is so proud of me I pretty much potty trained my self by watching the other dogs. I know how to use the stairs, I go to the yard and basement following mom around the house all the time. I do make a mess on the floor by pulling out all the doggy toys deciding which one to play with, there are so many to choose from. There are balls, road kill animals with squeakers and bones. What’s funny is when everyone goes to bed and Dad is sleeping in his chair, my mother instinct comes out. I bark till he wakes up and goes to bed. When we are all in the bed (2 adult, 4 pugs), I am happy and ready to go to sleep and snuggle next to you. I use doggy stairs to get in and out of bed. If your are interested in me be sure to complete the adoption form. I look forward to meeting you and I will be at the Meet & Greets soon! Interested in adopting? Marne’s minimum adoption donation is $325.